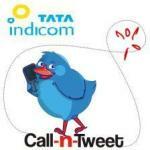 TATA Indicom subscribers can now Tweet on Voice. This ‘Call-n-Tweet’ service will enable Tata Indicom subscribers to update their Twitter status by posting Voice Tweets (short audio snippets) from their mobile without logging on the internet. To use this service TATA Indicom subsribers need to sign up at callntweet.com by using their twitter account details. Once registration is complete users can Voice tweet by dialing 50007. The subscribers pay a price of Re 0.80 for sending a voice tweet from their mobile. The Call-n-Tweet service on Tata Teleservices network had been sourced from Kirusa.